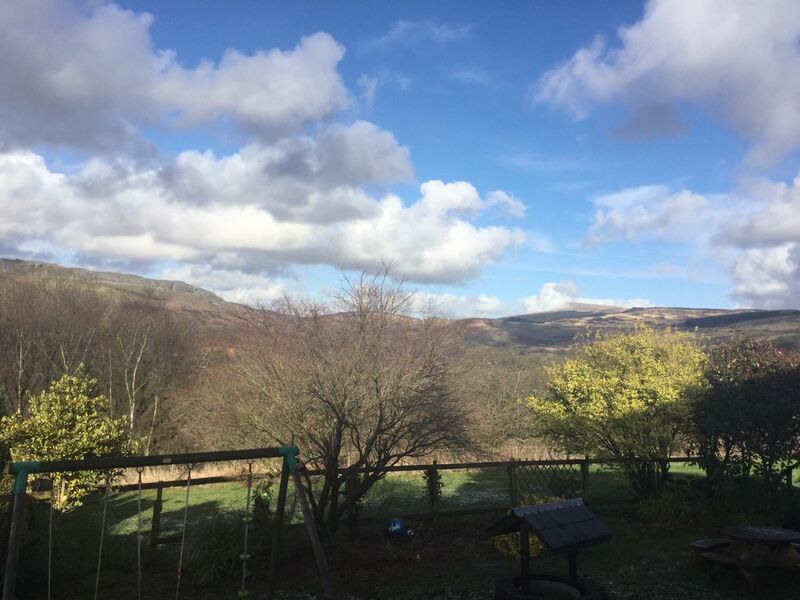 Situated at the Southernly edge of the Brecon Beacons National Park, Glasfryn Cottage is a self-contained property linked to our home. The cottage is an ideal location to explore the Brecon Beacons National Park and the beautiful Gower coastline. Pen-y Fan, the highest peak in the national park, is only 18 miles from the property and the historic market town of Brecon only 23 miles away. A 30 minute drive in the opposite direction takes you to the Gower Peninsula, with its award winning beaches. Henrhyd Waterfalls, the tallest waterfall in South Wales which featured as the entrance to the Bat Cave in the film 'Batman: The Dark Night Rises' is within walking distance of the cottage. The National Showcase Centre for Wales, Dan yr Ogof, is less than 5 miles away. The spacious cottage has a master bedroom with Super King and comfortable seating. The second bedroom on the ground floor has a King size bed, sofa and television. The third bedroom, adjoining the master bedroom, has twin beds and a window seat overlooking the garden and Cribath Mountain or as it is known locally the Sleeping Giant. The living area on the first floor provides breathtaking views of the local countryside. All rooms are furnished and decorated to a high standard with real oak floors. The well equipped kitchen has all the features you would expect including ceramic hob, built in fan oven with microwave , dishwasher and fridge with ice box. The open plan living/dining area provides comfortable seating, TV with DVD player and Sky Sat channels. We offer free WIFI but due to the rural location this is slower than in urban areas. The first bedroom has a Super King bed and comfortable seating. The main bathroom has a bath with rain shower over. The property has been awarded a 4* quality rating by Visit Wales. We offer comfortable beds, luxury cotton bed linen, 'Melin Tregwynt' Welsh woollen throws and cushions. A range of DVDs, books and traditional board games are available for guests to enjoy. Guests are welcome to use the enclosed garden which is shared with our home. There is a large gas barbecue for guests to use and a large outside table with seating. There is parking for 2 cars at the front of the property. A welcome basket with tea/coffee/milk/spring water and other tradition Welsh treats are provided. Towels and bed linen are included. Baby equipment such as a travel cot, high chair, stair gate, bottle steriliser can be provided if required. Sorry no pets are allowed. A washer dryer is situated in the main bathroom. We had an amazing stay. The cottage is absolutely stunning - home away from home. Perfect location, close to amazing walk/hikes, waterfalls,etc. We would definitely go back. Gareth is a great host. Great location, views and accommodation. A lovely well equipped house with great views and perfect location for mountain and beach activities. Ideal three generation family accommodation. Helpful and friendly owners. Perfect place for a quiet getaway, freindly neighbourhood and nice scenery. A must visit!! Many thanks for your kind words, you, your family and friends are always welcome at our cottage. High quality property with stunning views from the bedrooms. Lovely friendly and helpful couple who are very welcoming. Great area for get away from it all holiday -lovely walks waterfalls and even a handy gin distillery nearby! What more could you ask!!! Many thanks for your kind words, we hope you visit again. Absolutely loved our stay here. We had two small kids and both slept very well as did we. Enjoyed the countryside and our hosts as well! Vår familj hade en förträfflig semester i denna mysiga och funktionella våning. Supervänliga värden Gareth fanns tillhands med tips och råd kring våra aktiviteter och fick oss att känna oss både välkomna och uppmuntrade. Vi besökte gruvmuseet The Big Pit, vandrade i Brecon Beakons, samt hade en fantastisk halvdag på rovfågelcentret vid National Botanic Garden! Lite tips: Var uppmärksam på vägvalen bilens GPS föreslår; minsta kreatursstig tillåter 60 mph. Det är också en liten bit att åka för att köpa mat så se till att göra det på vägen dit.